I tried it in google.co.ve (in Spanish) and although it recognizes the colon (:) results come unexpectedly, giving pages about the colon (intentine) and percentage, come to results in English. About time Google realised there's punctuation in language! Google enhancements ... Good thing. This is so that Google+ searches will return Google+ links. It has nothing to do with actually trying to improve search. Still can't google %%. I have been trying to find out why people use "kill %%" rather than "kill %"
I very much doubt it's the case globally. I did notice *some* difference a few weeks ago. As an example I have noticed a difference with the "&". So some changes are happening. But searching for special characters would require re-indexing a whole lot and redoing search algorithms big time. In fact, try searching for punctuation marks plus words and you will soon see examples with no difference in the results. I have noticed that a lot of people building links on websites will sometimes use the [ ] symbols as a way of apparently bypassing onsite spam filters. 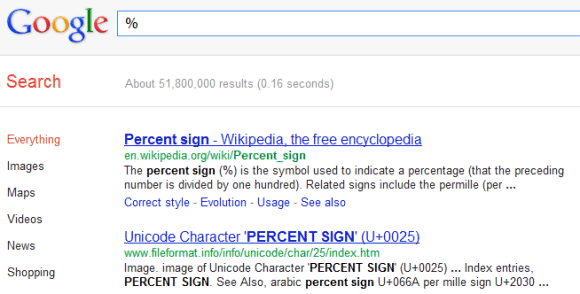 Google may be including some symbols as a way to ferret out these apparent spam comments and links. Just a thought. Sometimes they are. Sometimes I get really annoyed because I DON'T want any punctuation, I want a specific sentence. It should at least be an option. C'mon Google. You have the resources I know you do. You couldn't preserve the comment when I went to change user? Google is lazy. If Google wasn't so lazy they would include punctuation as an option. If I had a dime for every time I got frustrated because I go to search for something that's supposed to be one sentence and every result has punctuation like a question mark or a period in the middle I would be a rich man.